Antonia Darder is a distinguished international Freirian scholar. She holds the Leavey Presidential Endowed Chair of Ethics and Moral Leadership at Loyola Marymount University, Los Angeles and is Professor Emerita of Education Policy, Organization, and Leadership at the University of Illinois Urbana Champaign. Her scholarship focuses on issues of racism, political economy, social justice, and education. Her work critically engages the contributions of Paulo Freire to our understanding of social inequalities in schools and society. Darder’s critical theory of biculturalism links notions of culture, power and schooling, as well as cultural issues to the brain, testing, and inequality. In recent scholarship on ethics and moral questions of education, she articulates a critical theory of leadership for social justice and community empowerment. 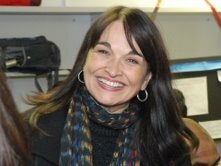 She is the author of numerous books and articles in the field, including Culture and Power in the Classroom (20th Anniversary edition), Reinventing Paulo Freire: A Pedagogy of Love, and A Dissident Voice: Essays on Culture, Pedagogy, and Power; co-author of After Race: Racism After Multiculturalism; and co-editor of The Critical Pedagogy Reader, and Latinos and Education: A Critical Reader.